Also, of all the artificial sweeteners out there, Acesulfame-K has undergone the least scientific scrutiny. Early studies showed a link to multiple cancer developments in lab animals. If you have any doubts whatsoever, remember this; humans have 99% the same DNA as the lab mice and rats tested. The "proof is in the pudding!" The research is concrete on this and ignorance is NOT bliss! (http://archives.cnn.com) This carcinogen, so cutely nicknamed "Ace-K," is derived from Aceto-acetic acid and Fluoro-sulfonyl Iso-Cyanate. Say that last part again and it sounds like you're eating cyanide. Consider your TOTAL health risks before consuming ANY artificial sweetener. Better safe than sorry! Artificial sweeteners represent what most Americans trade for convenience and laziness. Instead of eating "right" and exercising, they choose a convenient shortcut, but there's a price to pay for that shortcut, and it can be huge. Some people are dieting and some are just making sure they don't get fat (obese). Others don't even know it's in their food. Many have no idea it makes them crave more sugar and can ADD to weight gain. Then there are some folks who know it's in there, but take the tradeoff. In other words, they don't so much mind if they get cancer, they can just say "it was their time to go." America, for the most part, accepts disease and disorder as normal, as if it was their car breaking down after 100,000 or 200,000 miles. Oh well! Take it to the mechanic (quack Western Medicine M.D.) and tell him/her your symptoms. I'm sure there's something they can "recommend" and prescribe. Good luck. You'll probably see them at the baseball game, sitting in front row seats behind first base! Yes, we are the guinea pigs, my friends. Don't be a filter. Just read the labels and choose NOT to consume food chemicals. It's that simple (http://www.fooducate.com/). Just as a hint of what you're getting when you consume synthetic sugar substitutes, Sucralose is created by chlorinating sugar. That's the same CHLORINE in table salt. Its chemical structure is nearly the same as the banned pesticide ingredient in DDT. Hello Vietnam. 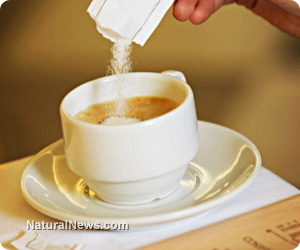 Ask your doctor if artificial sweeteners are right for YOU! Reported side effects include bladder issues and kidney dysfunction. If you look online under "Sweet Misery" or if you research 75% of the complaints sent to the FDA over the past decade, you will find everyone who is suffering and trying to do something about this food quality avalanche. Some complaints go as far as to say they feel like they have to go to the bathroom all the time. Their bodies are screaming to try and get these toxins out, before they burn a hole in the cleansing organ tissue. People complain on blog sites and websites about abdominal cramping, dizzy spells, memory blanks, headaches, aching joints and dry skin "eruptions." Many people swallow more than just "a little bit" of Acesulfame-K. You know how they say "a little bit won't hurt you?" What if it's in your coffee, tea, gum, "fat free" salad dressing, crystal light, candy, diet soda, multi-vitamins, cough syrup, vitamin water, and most products labeled "light" and "zero?"